Hubbard Street Dance Chicago’s Fall Series presentation of Peter Chu’s Space, In Perspective was full of hazards, one of them more than a little ironic. In introducing the project, Hubbard Street Artistic Director Glenn Edgerton had said, “We are looking to create a new audience experience of contemporary dance that is bold, adventurous, and forward thinking”, and the advance descriptions of the evening were full of convention-defying innovations in how Chu’s work would be presented. ‘Pushing the boundaries’ is always risky, because those boundaries often enclose what works well, and venturing beyond them requires inventing new ways of realizing an artistic vision. The ironic part is that the relentless quest to avoid everything cliche often falls into its own cliches. Not this time. Space, In Perspective was a dance concert, a real one, a great one. In many ways, it was even a conventional one. But what Peter Chu and Glenn Edgerton accomplished was something to see, as they quite literally wove new perspectives of dance into, around, and on top of a very different kind of dance concert. ‘Pushing the boundaries’ is always risky, because those boundaries often enclose what works well, and venturing beyond them requires inventing new ways of realizing an artistic vision. Krsti Licera: The whole idea of the evening was to take something traditional and force you to see it a different way. The entrance to the theater space set you up for a traditional dance concert experience, except you never got the five minute warning to find your seat. That missing sound told me that I was in for something different. Johnny Nevin: Instead of walking into the theater, a crowded lobby of people gathered around Glenn Edgerton, who spoke for a few minutes with some instructions, some encouragement, and not a lot of information. Having seen the advance press about the show, we knew that the performance was going to happen all around the theater — lobbies, stairwells, dressing rooms and backstage. Before the show, I told Kristi that despite being pretty skeptical of the whole idea, I was beginning to feel better about it, because it struck me as being much like street dancing. I had begun to think that in some ways they were bringing street dancing back to Hubbard Street, and bringing Hubbard Street back to the direct, personal interactions of street dancing. I was a little surprised when Kristi looked appalled that I would say such a thing. Kristi: I wouldn’t say ‘appalled’, just in happy disagreement with your choice of terminology. Johnny: Happy or not, Kristi looked so appalled that I didn’t actually press the issue until we went to talk to Hubbard Street Communication Co-ordinator Hayley Ross, and I told her what I thought. She looked as appalled as Kristi. … audience members were encouraged to move about the theater almost as if walking from exhibit to exhibit. It encouraged people to view dance as an art form, and to analyze it up close. Kristi: And her face was a reflexion of my own. I agree more with Hayley’s description of the first half of the evening being presented in an art gallery format — audience members were encouraged to move about the theater almost as if walking from exhibit to exhibit. It encouraged people to view dance as an art form, and to analyze it up close. In the current day and age of popular dance television shows, it’s important to differentiate dance for purely entertainment purposes and dance whose purpose is more artistic. 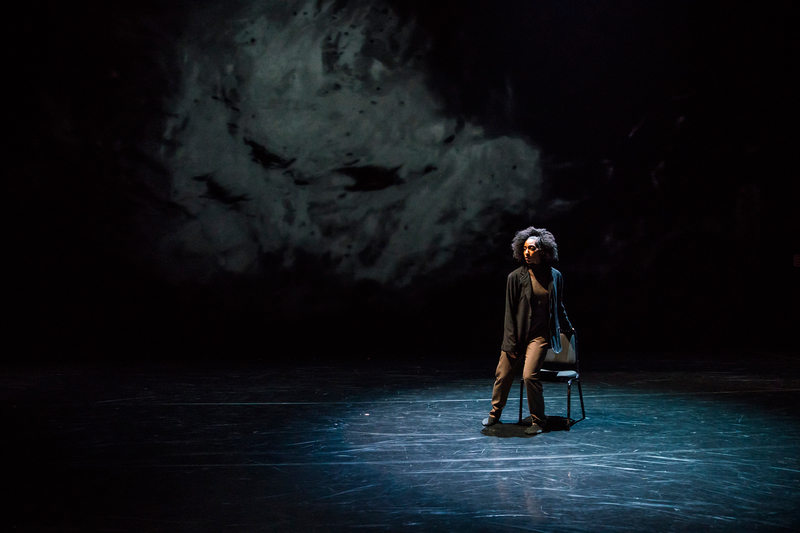 Johnny: As we wandered around the space, we found our way deep into the backstage hallways, where Hubbard Street Dancer David Schultz was sitting at a piano with a microphone and a small monitor. The score for the first part of the evening was a fairly random collection of tracks, which was fine because that’s the way it would be in a street dancing scene (just don’t tell Kristi or Hayley I said that again). To one of those tracks, Schultz was laying piano and harmonica lines perfectly into the arrangement, staying in time with the monitor at his side, and with the microphone mixing his live performance into the score for the entire, wandering, massive space. It was just part of the artistically intense, and technically precise accomplishment that characterized the evening. I assume that the Olympic Gold Medal or Academy Award, or whatever you get for amazing production should go to Hubbard Street Production Manager Scott Nelson, but there were a lot of other people in on it I’m sure. Kristi: You forgot about the part where David stood up from the piano bench and performed the most epic hallway solo I’ve ever seen. Aside from David’s incredible talent, what also struck me was the diverse collection of audience members that had gathered in that hallway. I don’t know about them, but I thoroughly enjoyed the intimacy of the small space, even if it meant being splattered with dancer sweat. You forgot about the part where David stood up from the piano bench and performed the most epic hallway solo I’ve ever seen. Johnny: If any of you reading this are looking at the picture of David Schultz above, and thinking ‘what piano?’, just wait, he comes back. Johnny: When we wandered onto the stage, where the rest of the concert took place, I actually thought we were still wandering. There was a breathlessly beautiful projection at the front of the stage, obscuring at first that we were actually facing out into the open and empty audience seating of the Harris Theatre. The audience was seated on three sides of the stage, the fourth side the projection, surrounding the performance area where the rest of the concert took place. Chu shifts your perspective yet again, by showing you the human body in a more architectural form. Kristi: What struck me the most about this change in perspective is that this is usually how I experience dance. I’m usually the one on the stage, looking out into the audience, so for me to be viewing dance instead of performing it was almost a sensory and emotional overload. My feelings were amplified by Peter Chu’s exquisitely explorative choreography, which utilized three movement motifs that I could distinguish, shown in varying tempos and evolutions. Chu shifts your perspective yet again, by showing you the human body in a more architectural form. Houle found softly mixed musical beauty to blend against his percussive dynamics, and Chu made the score dance. Johnny: The music for the final portion, and what turned out to be the majority of the actual concert, was beautifully crafted and brilliantly produced. It began with a long, ethereal solo from David Schultz, this time on vibraphone, as it gradually became more apparent that this changing concert had changed into a more structured, choreographed form. Djeff Houle’s score seems to have begun here, because he certainly hadn’t written “This Land Is Your Land” or “Heart and Soul” for the opening, scattered scenes. But it’s hard to know whether David Schultz’ solo was part of Houle’s score, or if it came from Schultz’ own accomplished musical imagination. Houle’s composition was highly percussive, but in a further quiet defiance of conventional choreography, it was musically rich as well. Much of original music for dance is percussive without content, probably because the emotion and trajectory of more melodic content seems to crowd choreographers, who don’t really know that much about music. They may know how it sounds, but they rarely understand how it works, and although they can often enrich it with new dimensions of movement, they often step all over it. Houle found softly mixed musical beauty to blend against his percussive dynamics, and Chu made the score dance. Johnny: At the end of the performance, when the entire cast disappeared from the stage and reappeared out in the audience seats of the theater — leaving the entire audience on stage — the title, the opening, the entire experience all came into a very new perspective, one that was “bold, adventurous, and forward thinking”, just like they said. Kristi: In dance, we often play with the idea of ‘negative space’ – think of creating an enclosed circle with your hands and arms. The space inside of your arms is the ‘negative space’ – the place in which there is nothing. This concept exists in architecture, but in reverse. The space that we refer to in dance as negative is actually positive space in architecture. Chu was consistent in challenging the audience’s perspective for the entire duration of the performance. He made me question how the positive spaces of the body could work with the negative spaces of the theater, and depending on where I was viewing movement from, what difference my physical perspective made on the perception of the evening as a whole. Next time you walk into a theater, maybe you’ll think twice about where your seat is supposed to be. PHOTOS (FROM TOP): Hubbard Street Dancer Renee Butler in Space, In Perspective by Peter Chu. Photo by Todd Rosenberg.• Hubbard Street Dancers Jacqueline Burnett, Alicia Delgadillo, and David Schultz in Space, In Perspective by Peter Chu. Photo by Todd Rosenberg. • Hubbard Street Dancer David Schultz in Space, In Perspective by Peter Chu. Photo by Todd Rosenberg • Hubbard Street Dancers in Space, In Perspective by Peter Chu. Photo by Todd Rosenberg • Hubbard Street Dancers Andrew Murdock, Elliot Hammans, and Adrienne Lipson in Space, In Perspective by Peter Chu. Photo by Todd Rosenberg.